This is the sixth in a series of blog posts discussing the collaboration of the Collab Lab and our EG Ed Prep students. Please follow along on our journey using the hashtag #214EdPrep or clicking on the label #214EdPrep in the word cloud! 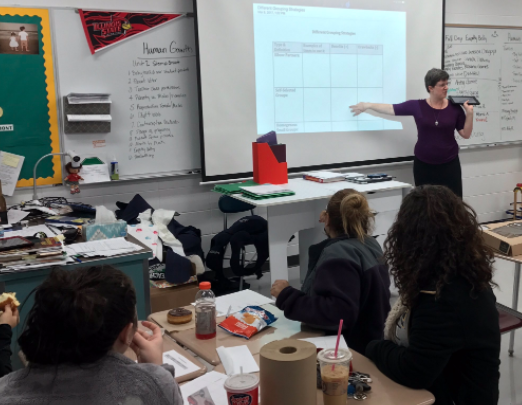 In continuation of our Spark Sessions (read more here and here) with our District 214 Ed Prep students, Kim Miklusak and Mark Heintz presented different methods of grouping students and how to use manipulatives to activate prior knowledge. Kim passed out a worksheet of the various grouping strategies with each group, who, as it turns out, were all set up in self-selected groups. She walked the students through each type of grouping style, describing the definition of each and making connections to times in other classes that the students would have participated in such groups. They briefly discussed the positives and negatives to each type of group so that the students would be able to apply different strategies depending on what lessons they are using with their own students in the coming weeks. Next, he had students move to a new group, creating groups of 3-4 consisting of no students from their original table. They now were going to play an activity called "Word Grab" using the small rectangle pieces from the envelopes. For this game, he says a definition, and the students have to grab the correct word. Each word was a reason to use the activity. For instance a few of the words were background knowledge, prior learning, and movement. Mark and Kim ended the session by looping back to Kim's lesson to show the class how they used different student grouping strategies to complete Mark's lesson! Following the Spark Sessions, Linda Ashida reminded students about the benefits of using social media for professional learning as well as reflection. She also showcased Hannah Irizarri's blog post, in which she shares how she used a strategy from last week's Spark Sessions in her own field placement. More blog posts to come. Follow #214EdPrep and @EGCollabLab for more!